A Federal Aviation Administration reviewed landing zone is desirable at hospitals that frequently use Survival Flight. At other sites, including accident scenes, certain rules should be observed for safe operations. Landing zone (LZ) area must be obstacle free, this includes trees, debris, wires, signs, stumps and trash. The LZ should be 100 feet X 100 feet and as flat as possible. The LZ should be marked with flares or lights. Keep lights shining downward to avoid blinding the pilots. Notify Survival Flight communications by phone and the flight crew via the HEAR radio of any obstructions on or near the LZ. Keep the entire area clear of people and vehicles. All persons should stay away from the aircraft until told to approach by the pilot or crew. Landing zone acceptance or general LZ suitability is at the discretion of the pilot. Landing of multiple aircraft in the same LZ is at the discretion of the pilots involved. Simultaneous operations of multiple aircraft will only be performed when the pilot of the landing aircraft is able to communicate his intentions with other pilots using the LZ. 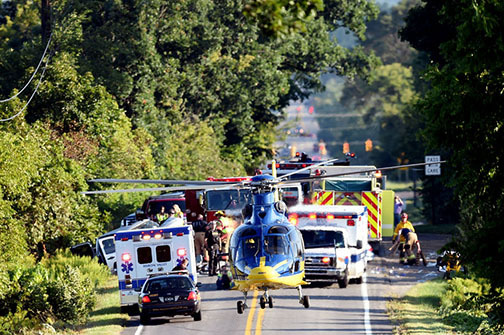 Survival Flight reserves the right to deny transport of patients deemed by the Incident Commander as a Hazardous Materials Incident or a scene involving a reportable quantity of hazardous materials release. For further information or to schedule Landing Zone Classes, please call Survival Flight at (734) 936-6035 or 1-800-822-2233. NEVER Approach the Aircraft from the rear! Main helipad located on the northeast side of Michigan Medicine. "Please click here for our preferred arrival/departure routes and noise abatement areas." Overflow pad located on the northwest side of Michigan Medicine. Survival Flight is dedicated to providing education to our partners in the community. We provide landing zone classes to Fire, Police and EMS agencies with the goal to maximize safety during scene operations. We discuss how to set up a safe landing zone and ways to avoid certain hazards. Once the classroom portion is completed and a landing zone has been properly constructed, an available Survival Flight helicopter will land. Due to the large number of Landing Zone Class requests, we are proud to offer our new Regional Landing Zone Class. We are working with Fire Departments to reach out to neighboring agencies in order to reach as many agencies as possible. CEUs are available.